Around Skjól Camping there are many interested places to explore. Everything from bubbling geothermal springs to glaciers. Few of the attractions are listed here below and make sure to ask for tours through the area from our staff members. Our location will give you access to lot of places to explore and our staff will help you reach those locations, either by foot, by a car or on horseback. The main attractions are of course Gullfoss and Geysir but there are many hidden pearls close by so be sure you ask around and get directions by our staff and plan your daily trips in advance. Geysir is basically in our garden. 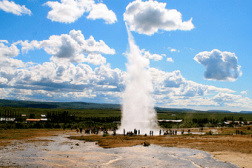 The placename "Geysir" has been first mentioned in written sources in 18th century, the term became popular and has been used for similar hydrothermal features worldwide since then. Kerlingafjöll is on the route Kjölur and about 1 hour drive into the highland. It used to be ski resort during summer but last years the climate has changed so the snow melts away. It's a geothermal area and place worth visit for a bath and soup. Laugavatn It is situated at a popular touristical round-trip, the Golden Circle and acts as a popular staging post in the area. If somebody wants to go from Þingvellir to Haukadalur, it is possible to follow a track through an interesting volcanic landscape and along Laugarvatn. 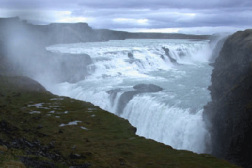 Gullfoss or the Golden Waterfall is only 5 minutes drive from Skjól. Gullfoss is in the river Hvítá (engl. white river), which has its origin in the glacier lake Hvítávatn (white river lake) at Lángjökull glacier about 40km north of Gullfoss. Jarlhettur ridge is located east of the Langjökull in Iceland's Western Volcanic Zone. It consists of two sub-parallel ridges, of varying length and partially off-set, which trend north-east to south-west and constrain the eastern boundary of Hagafellsjökull Eystri.